Walk This Way is a chic lace shell, shaped at the waist with a high collar. Imitation Embroidery is its lace, a simple 6 stitch by 6 row repeat. 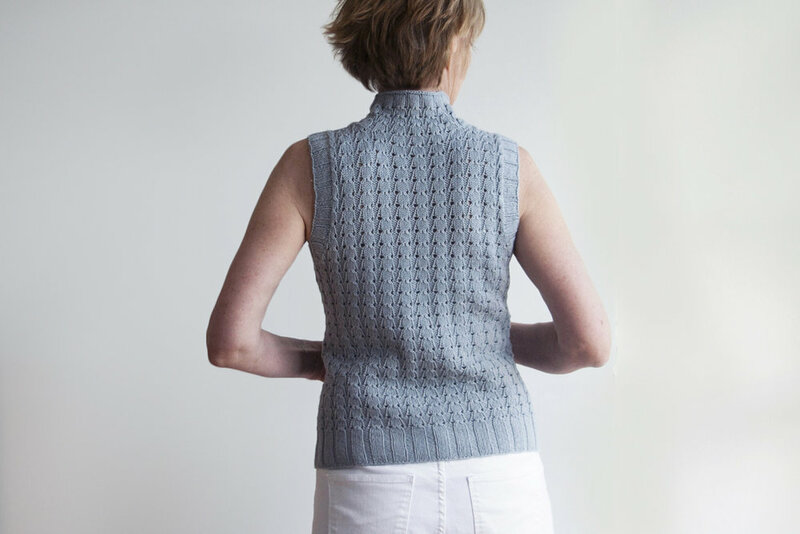 This design is worked bottom up, seamlessly in the round and trimmed at its hem and armholes with a wide panel rib spawned from its stitch pattern. Its collar continues the lace, that is then modified slightly for a tapered ending. Intended initially as a warm weather topper you'll find it works well as a layered piece too, for all-season wear-ability. Enjoy! Shown in Tern yarn by Quince & Co. (75% American wool / 25% silk; 221 yards / 202 m per 50g skein); color – Mist #403; 3, 4, 4, 5, 5, 5, 5 skeins, or for comparable yarn, approximately 655, 745, 825, 920, 995, 1055, 1110 yards / 600, 680, 755, 840, 910, 965, 1015 m.
Long-tail cast on, circular knitting, decreasing (skp, ssk, k2tog, p2tog), increasing (m1L, yo), short row shaping, stitch pick-up around neckline and armholes, 3-needle BO, and blocking. You'll find this pattern on sale for on Ravelry.